When the first time i went traveling i had no clue what card to use for communicating with my family. My first journey from Indonesia to Malaysia at end of January 2007. I decide to use telkomsel card that i used in indonesia and plan to replace it with phone card from malaysia. Far before that i bought a cellphone that had more "band" so i could use it in so many different countries. My cellphone that time was Sony Ericsson W300i. Its a walkman phone, cute and had big memory and not that expensive. It had 3 band. So i use simpati card and fly to Malaysia, then realized that i still could use my phone card normally there. But alas ! when my friend from indonesia calling and i pick up the phone, the cost its charged with international fees !!! omg !!!!! Running out of credit... then because i am so well planned (hahahahaha !!!!) i also already register my bank account so i could access my account from internet using internet banking and get some extra credits for my telkomsel ! and if i can't find place to access internet i will send sms to my sister in indonesia to refill my phonecard. Then i went to singapore, eventually telkomsel work together with singtel, so i dont have to change my phone card again ! So i kept using my old phone card so my family could easily text me. My second trip to thailand. I brought my simpati card again, and from krabi until chiangmai... wow.. its working ! but the cost really expensive i think its Rp1 500 per sms !! 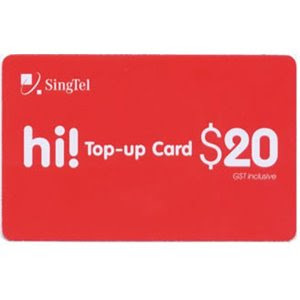 But i am thinking about other option to get a singapore phone card. Some people said it would be cheaper... b ut , yeah maybe ill try that next time i travel. Phone card very easy to find in singapore. Because its a pre paid one so you could use it again when you travel again to singapore. As long as you top up the card (refill the credit). Theres few choices... once Mr B. Kearns ever gave me singapore phone card but i never use it because somehow its not working in Thailand. I think its belong to Singtel.